I have officially survived my first week of being 25. Thank you so much for all your sweet messages and kind words. It truly means more to me than you know! 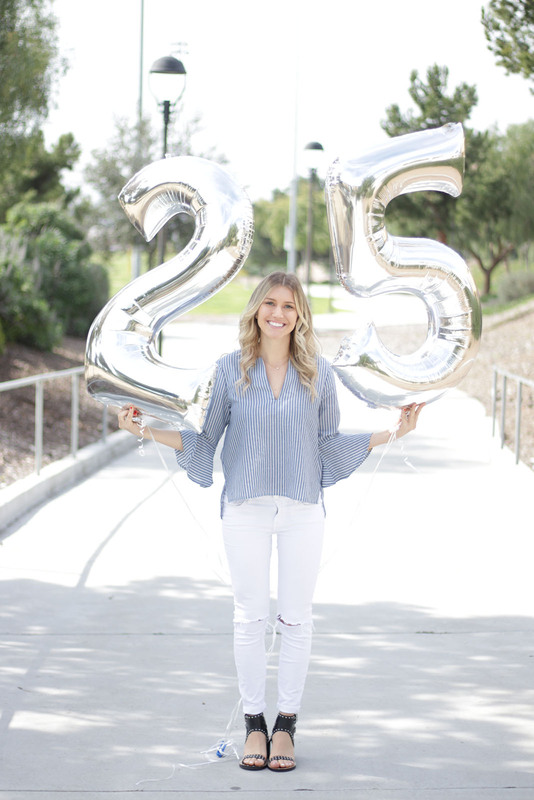 I have honestly been freaking out about turning 25 for so many years. 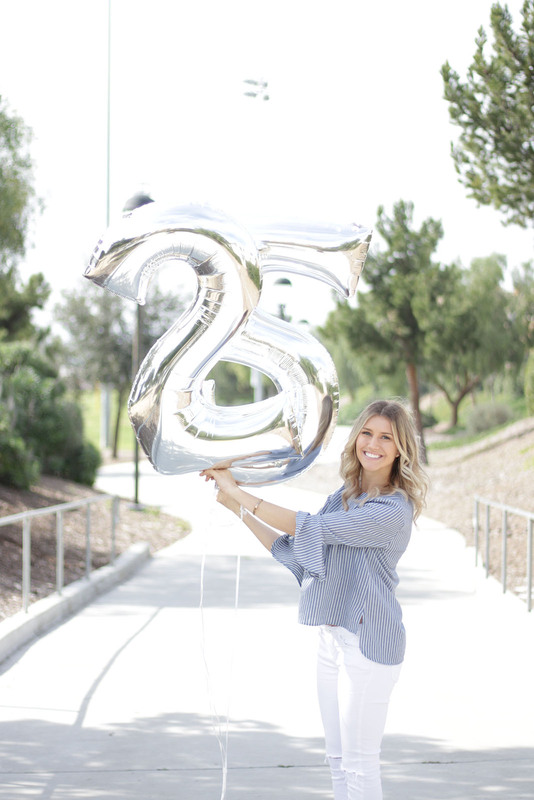 25 just seems SO old and I still can’t believe I’ve already reached a quarter of my life. I don’t understand how this happened so quickly?! I had many expectations of what I was supposed to be doing with my life at 25 and when I look back on all that I had planned for myself at this age, I can’t help but laugh. I haven’t lived up to many of my expectations quite yet, but I know all those things will happen eventually when the time is right. But I have learned a lot of valuable lessons in these quick 25 years and I thought I’d share some of them with you. 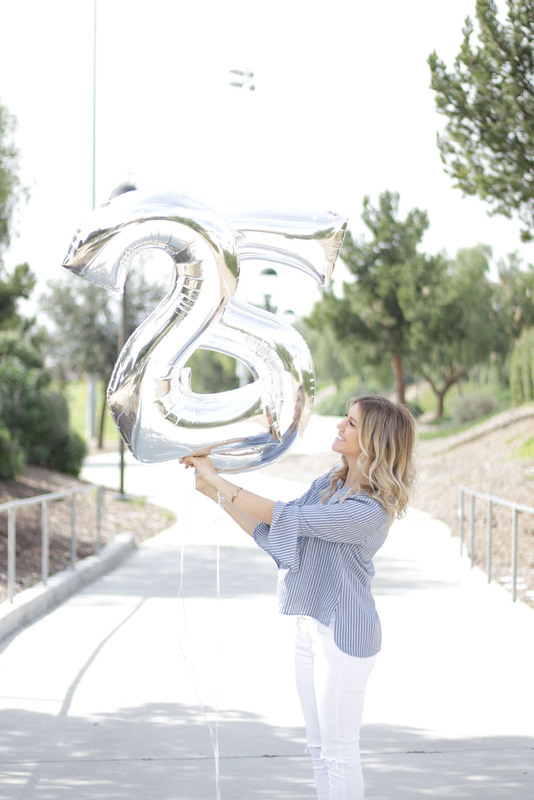 I sure as heck don’t think I know everything, but I wanted to share with you 25 things that I’ve learned in my 25 years. 1. Be positive. One of the main things I’ve learned in my 25 years is the power of positivity. I pride myself on this one because I always try my best to stay positive in any situation. Only YOU can change your mindset. 2. Not everyone is going to like you. I heard someone once say something along the lines of ” you can be the sweetest, juiciest, most delicious peach, but there’s always going to be someone out there that doesn’t like peaches.” This is so true in every aspect of life. Not everyone you meet, whether it’s in real life or online, is going to like you. That’s just a fact. You’re never going to be able to please everyone, no matter how “perfect” you are. But as long as you do whatever it is that makes YOU happy, that’s all that matters! 3. Family comes first. Always! 4. The only thing that will ever completely satisfy you is the Lord. Remember to make time for Him and always trust in His plan for you. 5. Always be kind. You never know what someone’s going through behind closed doors. 6. Eat the donut – don’t deprive yourself of the good things in life! You only live once right?! 7. Be yourself. So cliché I know, but my goodness. God made you the way you are for a reason, so embrace it. Be different. Stand out. But always stay true to yourself! 8. Save your money. Adulting is hard, and expensive. As much as I would love to go back to the days where my parents paid for everything, there’s something so rewarding about working hard and being able to take care of yourself. It’s good to spoil yourself every once in a while as well but be smart with your money. You never know what life is going to throw at you. 9. Work hard. Whether this be at your job, in your relationships, working out or whatever it is – work hard. No one is going to do the work for you. If you want to see results, you must put in the effort. 10.Be honest. Man, this is a big one in my book. Be honest in everything you do. Every big lie starts with little white lies, so don’t even let yourself get in that habit. 11. Get out of your comfort zone. It’s so easy for us to stick to what is comfortable in our life, but the second you step out you will realize all of the amazing things you are missing out on. For me, something out of my comfort zone was starting this blog. I can’t even begin to tell you how many times I wanted to quit and give up. Not only was this challenging for me because I had to put myself out there, but having to learn everything about starting a website ALL by myself was so much more work than I thought it was going to be. But I’m so glad I pushed myself and stuck with it. It’s been one of the most rewarding experiences seeing myself grow in so many ways I never knew possible. So be bold and put yourself out there. I promise you won’t regret it. 12. Be there for people even when they aren’t there for you. 13. Be grateful for everything in your life. We are all so blessed and even on our worst days, you always have something to be grateful for. Remember those things when times get tough. 14. Let things go. Forgive people because at the end of the day, you’re only hurting yourself by holding onto things. I’m not perfect, no one is, so show grace. 15. Live a healthy lifestyle. Take care of yourself mentally and physically. Be active, work out, eat foods that nourish your body. Get plenty of sleep and take time out of your everyday to relax and just breathe. Everything will be alright! 16. Don’t stress. HA! Easier said than done, right? ? I wish I could follow my own advice on this. But you have to learn when enough is enough. I’m not saying don’t work hard, I’m encouraging you to know how much you can handle and don’t stress the rest. Do something that relaxes you everyday whether that be working out, reading, watching your favorite show, taking a bubble bath or just sitting outside. Whatever it is that makes you slow down, take time out of your day for some “me” time. 17. Travel. Oh my goodness, my favorite part of life. There is honestly nothing better to me than traveling. Getting to experience different cultures, seeing new places, and trying different foods are such value experiences that can’t fully be appreciated and understood unless you experience them first hand. My dream is to become a world traveler like my grandparents one day! 18. Laugh. Be silly! It’s okay to be a little weird. Life is way too short to be serious all the time. Have fun! 19. You aren’t going to remain friends with everyone. This is something I struggle with. Friendships take work on BOTH ends. You can’t make excuses… everyone is busy. Everyone works and has stuff going on in their life. Bottom line, you make time for the people you care about. And forget about the people who don’t. 20. Pursue your dreams and take risks. No matter what your dream is or whatever risk it takes you to get there, believe in yourself. 21. Be spontaneous/adventurous. Even if that means going to a new restaurant or taking a little weekend trip somewhere you’ve never gone before. These experiences force you to try new things and step outside of your everyday routine. 22. You can’t do everything. And you can’t please everyone. I am definitely a people-pleaser but I am slowly learning that you will drive yourself crazy if you try to please everyone. You have to learn when it’s okay to put yourself first, ask for help or just say no. 23. Stand up for what you believe is right. Even if your standing alone, do the right thing. 24. Pray always. Pray for your struggles, your challenges, your family, your “enemies”, your haters, your future children, your victories, your health. Whatever is it – PRAY. 25. And last but not least – listen, appreciate and respect your parents. Cheers to the next 25 years, and having an excuse for any quarter-life crisis that happens this year. HA! ?